/ Beat Afternoon Fatigue with These Rejuvenating Juice Recipes! 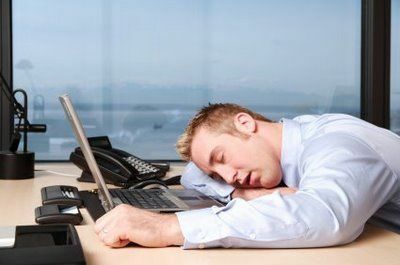 A common theme in everyday modern life is the mid-day energy dip. It’s funny how it seems to happen to everyone at roughly the same time – as though it’s a divinely coordinated event that we all participate in, usually against our will. 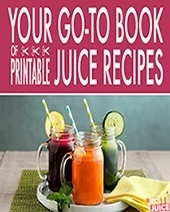 If you’re tired of the drooping fatigue that plagues you, here are some energizing juice recipes to keep you running smooth and strong. Coco Splash is one of my favorite juice recipes. It’s so simple to make and so deliciously refreshing! It’s the perfect pick-me-up juice to have whenever you can use a little lift. The coconut water in Coco Splash is a natural source of electrolytes such as potassium to replenish your system. 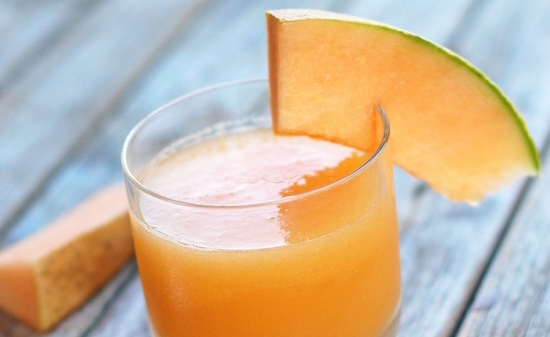 And cantaloupe is a rich source of the antioxidant vitamin A (100 grams of cantaloupe provides 112% of your daily vitamin A) as well as a source of energizing B-complex vitamins. Oh, and did we mention that Coco Splash is mind-blowingly yummy? 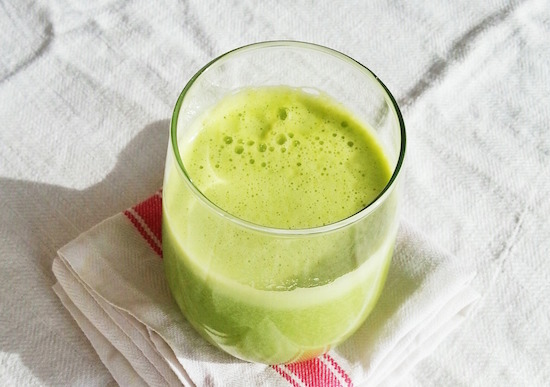 The result is a gentle juice that’s chock full of chlorophyll, which will give you a natural energy boost without any of the usual bitterness that comes from many green juices. Both the spinach and Romaine lettuce are very beginner-friendly and will help get your tastebuds used to the taste of green juice without overwhelming them. And the pineapple adds a very welcome tart sweetness to the mix as well as giving the juice a bit of a digestive boost. Sip before meals! 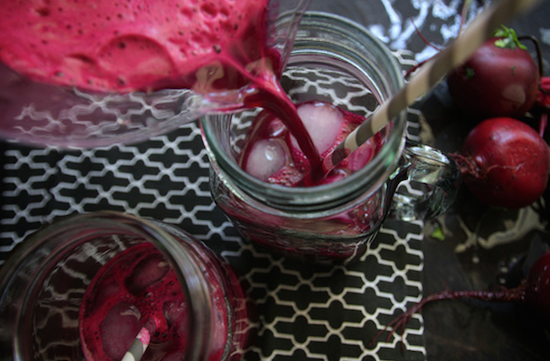 Overall, a supremely reinvigorating drink, packed with energy-stimulating parsley, nitrate-rich beets, ginger to speed up your circulation, and lemon for electrolytes such as potassium, calcium, and magnesium to keep you going all day. It gives a blast of chlorophyll without the bitterness that some green juices bring. The end result is a pleasantly sweet, wonderfully refreshing, energy-boosting powerdrink that makes it hard to believe it’s so good for you! 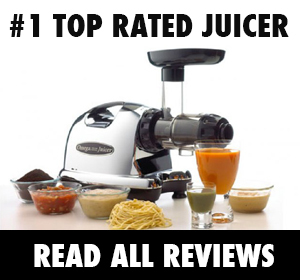 If you haven’t yet tried ginseng in a juice recipe, this is your chance! 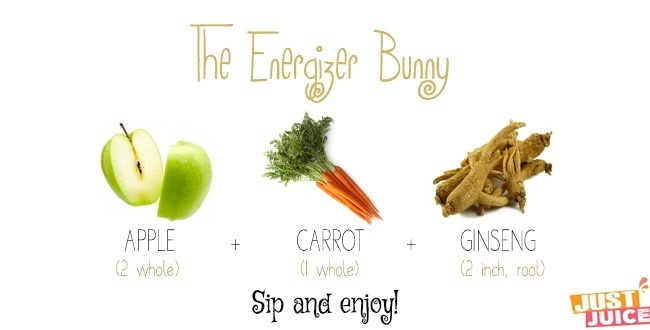 The Energizer Bunny is a rejuvenating juice that takes just a few minutes to make and results in energy that keeps going and going. Ginseng’s super multi-faceted – this potent root boosts immunity, purified your blood, reduces stress, increases stamina and goes a long way toward improving your overall energy levels. 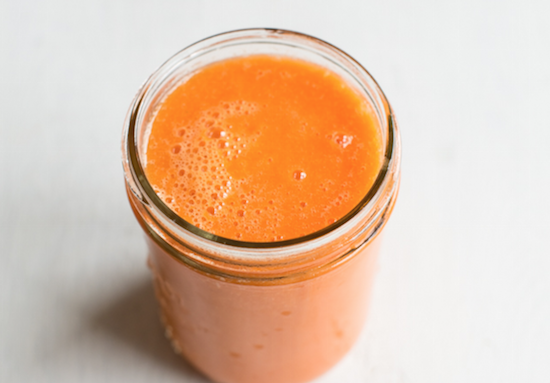 To top it all off, apples and carrots add an anti-oxidant-laden sweetness to the mix! In case you find the taste of ginger too strong for you, you can increase the carrots and decrease the ginseng to start. Apples, of course, are an oldie-but-a-goodie superfood. Just one of these crunchy yummers pack in over 8 milligrams of Vitamin C, which amounts to about 14% of your daily recommendation, and have been linked to everything from helping to fight cancer to acting as an aid against diabetes. 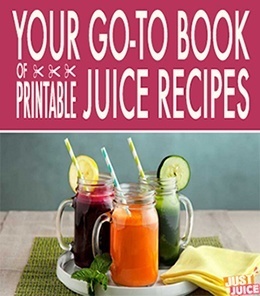 ***This juice might come on a bit strong, so be sure to dilute it with water if necessary! Oh, and if you’re not into the taste of ginger (yet), go for an inch rather than two. Hi Mark, thanks for stopping by and sorry to hear about the chemo fatigue. That can’t be easy; am wishing you the best and a more-than-speedy recovery. About best juices for overcoming fatigue – go green. Juicing greens is great for natural, lasting energy as well as your whole body. 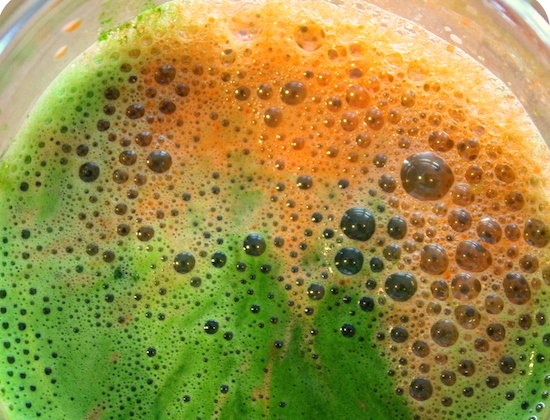 Here’s a guide to green juicing, if you’re interested. Just please remember to mix up the greens you’re juicing – there are so many options and quite a few greens you can grow right at home so diversity is a pretty easy practice 🙂 Not to mention growing your own greens like wheatgrass and barley grass at home ensures you’re drinking organic. Also for fatigue – try juicing produce that’s good for your digestion (especially before meals) as well as your circulation since both of these improve energy. Several herbs are great for this – parsley, ginger, fennel – as well as pineapple, garlic, and cabbage. Let us all know how it goes, will be sending warm wishes your way – you’ll get through this and emerge in better health than before!